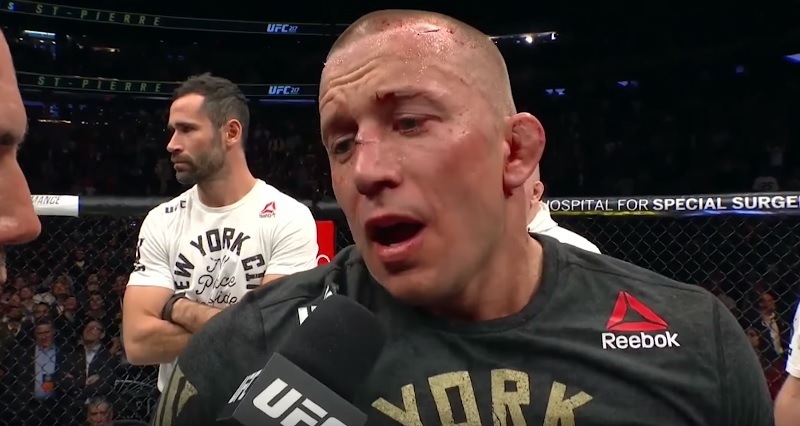 It has been almost four years since Georges “Rush” St. Pierre, 36, fought in the cage. 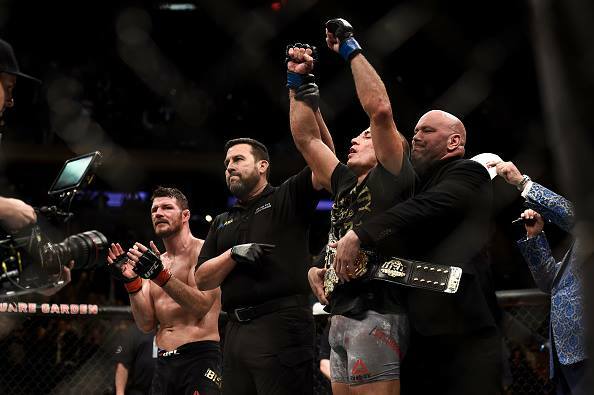 The Canadian MMA fighter returned victoriously on Nov. 4, Saturday, by dethroning Michael Bisping, 38, at “UFC 217” at Madison Square Garden in New York City, New York. At 4:23 of Round 3 in the main event of “UFC 217,” St. Pierre submitted Bisping via rear-naked choke. This is the first time Bisping lost an MMA fight via rear-naked choke and this is his first loss in the past two years. Prior to “UFC 217,” Bisping’s last MMA loss happened on Nov. 7, 2014. He lost to Luke Rockhold, 33, via guillotine choke submission at “UFC Fight Night 55” at Allphones Arena in Sydney, New South Wales, Australia. After “UFC 217,” Bisping’s record downgraded to 30 wins and 8 losses. On the other hand, St. Pierre currently holds a record of 26 wins and 2 losses. The only two fighters who defeated St. Pierre are Matt Hughes, 44, and Matt “The Terror” Serra, 43. St. Pierre lost to Hughes via armbar submission at “UFC 50” on Oct. 22, 2004 and to Serra via technical knockout via punches at “UFC 69” on April 7, 2007. As the new UFC middleweight champion, St. Pierre is expected to face Robert “The Reaper/Bobby Knuckles” Whittaker, 26, in 2018. The latter became the interim champion in the division after defeating Yoel Romero, 40, at “UFC 213” on July 8 at T-Mobile Arena in Paradise, Nevada. Before Bisping, the last opponent St. Pierre had was Johnny “Big Rig” Hendricks, 34. On Nov. 16, 2013, St. Pierre defeated Hendricks via split decision at “UFC 167” at MGM Grand Garden Arena in Las Vegas, Nevada. Hendricks was also in the main card of “UFC 217.” He lost to Paulo “Borrachinha” Costa, 26, via technical knockout in the second round.